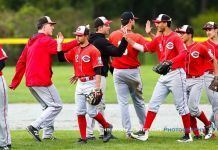 July 31, 2013 Victoria, BC (ISN) – The Victoria Jr. Mariners played host to the Whalley Jr. Chiefs on Sunday at Layritz Park. The Jr. M’s had the hot bats, collecting 30 hits in the 2 game set, as they took both games by scores of 15-7 and 14-4. Game 1 saw the Chiefs get out to an early 3-0 lead after the top half of the opening inning but the Jr. M’s would answer right back with 4 runs of their own. They would add 4 more in the 3rd inning giving them what looked like a commanding 8-3 lead. Whalley would have something to say about that in the top of the 4th as they cut the lead to just 1 run. The Jr. M’s would bring Jordan Strandlund to the mound to relieve starter Liam Catto and he was successful in shutting down the Chiefs bats for the next 2 innings earning the save. Victoria would add to its lead scoring 1 in the 4th, 2 in the 5th and 4 in the 6th taking a 15-7 lead into the 7th inning. Cole Haddock now on the hill for the Jr. Mariners closed out the final 2 innings allowing just 1 hit and securing a 15-7 win. The Jr. Mariners would take control early in Game 2 scoring 4 in the 1st and 3 in the 2nd to go up 7-0. Whalley wasn’t quite finished yet, Colin Kellington smacked a triple that scored a pair, then a Jr. Mariners error allowed 2 more to cross the plate and with the score 7-4 after 2 ½ innings we looked to have a ball game. The Jr. M’s put a quick end to the Chiefs comeback scoring 5 runs in the bottom half of the 3rd to hold an 8 run lead. They would close it out in the bottom of the 5th scoring a pair to bring the lead to 10 and have the mercy rule come into effect. Leading the Jr. Mariners offense were Mitch Bryan finishing the day going 7 for 8 with 2 doubles and 2 RBI’s, Brett Irvine went 5 for 7 with 3 doubles and 5 RBI’s while Nick Seginowich went 5 for 8 with 2 doubles and 4 RBI’s. The Jr. Mariners have a firm hold on 7th place in the standing and will look to improve on that on Wednesday night when they take on the Victoria Jr. Eagles at Lambrick Park at 6 pm. Next articleStryker-Indigo and Island Sports begin roll-out of new Canadian sports platforms and news content.